Robust nestable design with Zinc plated finish. 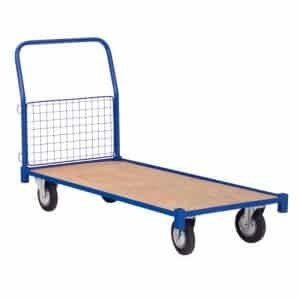 Integral folding shelf allows a number of trolleys to be nested together. Heavy duty PVC coated handle bar for user comfort. Heavy duty hinged base allows for a load capacity of 320ky. Four swivel non-marking castors for extra mobility. (H)940mm x (W)500mm x (D)900mm. 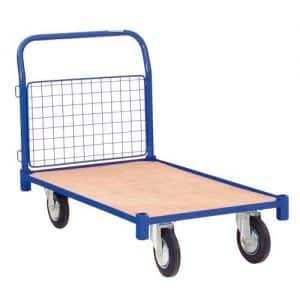 All purpose steel framed trolley designed for any environment. 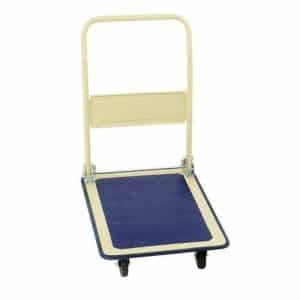 Anti-slip PVC platform allows for transportation of various loads. Protective PVC side buffers to prevent damaging and marking of doors and walls. Folding handles for compact storage. Hard wearing solid rubber wheel for easy manoeuvrability. Load capacity up to 175kg. Large Lugger (H)840mm x (W)600mm x (D)890mm. Small Lugger – (H)820mm x (W)480mm x (D)740mm. 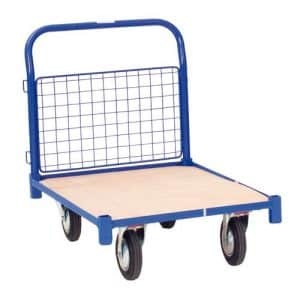 Sturdy platform trucks welded from tubular steel with 9mm thick plywood decks. Scratch resistant powder coated steel frame. 2 fixed 2 swivel heavy duty bearing wheels. Platform Dimension (W)700mm x (D)1000mm. Overall dimensions (H)900mm x (W)700mm x (D)1500mm. Available in depths of 1000mm and 1200mm. Overall dimensions (H)900mm x (W)700mm x (D)1200mm. Available in depths of 1000mm and 1500mm. Sturdy platform truck welded from tubular steel with 9mm thick plywood decks. Overall dimensions (H)900mm x (W)700mm x (D)1000mm. Available in depths of 1200mm and 1500mm.